When you design company wellness programs there are two basic options: use an outside vendor or develop your program internally. Regardless of the option you choose, there are several steps you need to take to have a successful program. Support from all levels of management is key to the success of your wellness program. To gain management support, inform managers about the program early on and encourage them to participate. Regularly communicate the goals of the program and the anticipated benefits to both the company and employees. Here is the complete list of strategies you can use to get strong leadership support for your wellness program. 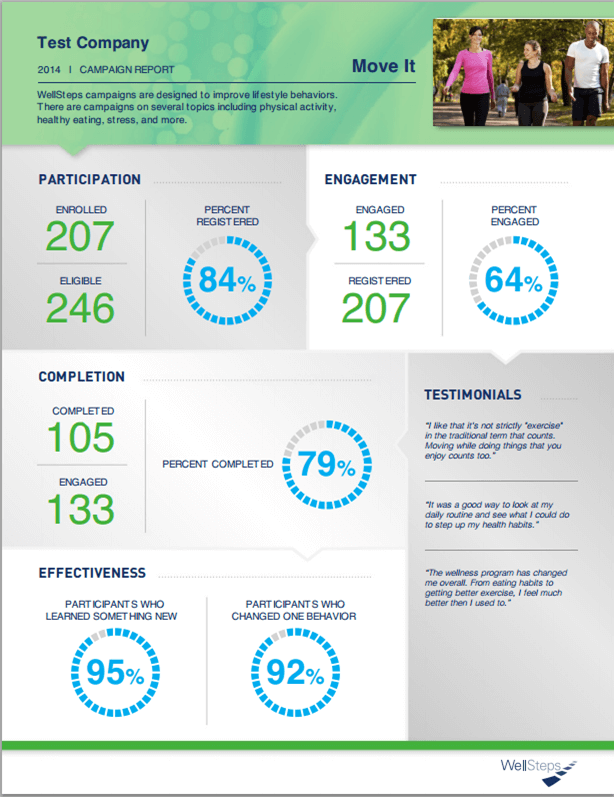 A wellness committee is responsible for promoting the program, planning activities, communicating with management and employees, and facilitating program evaluation. The size and composition of the committee will depend on the size of your company and the scope of the program. A committee of at least 6 and no more than 12 should be adequate. The committee should include staff that represent various employee shifts and departments such as management, union representatives, human resources, or administrative assistants. A wellness coordinator should be designated by management or elected by the wellness committee. The primary role of the coordinator is to lead the wellness committee and to coordinate the internal delivery of the program. Program success is often linked to the coordinator’s time and ability. It is essential that some or all of the coordinator’s time be dedicated to the wellness program. If this isn’t possible, then an outside vendor should be contracted. The wellness committee should meet at least on a quarterly basis. The committee may meet more often during peak times when planning or implementing activities or programs. Meeting frequency will depend on the committee goals. 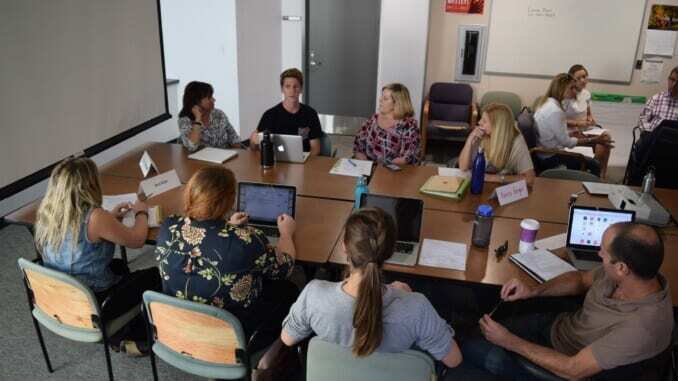 To revitalize the wellness committee, make committee membership a one or two year commitment so that new ideas and constituents are included on a rotating basis. The committee should create a communication mechanism with management so successes can be reported. Effective delivery of wellness initiatives is often dependent on a leader that is close to the participants. Depending on the structure of your organization, you may want to develop smaller teams that have leaders or “captains” to help provide motivation, information, and support to the program participants. Leaders have a major impact on whether the participants have a positive experience. A team leader can be the point of contact or messenger for information shared between the program participants and the wellness committee and vice versa. It is important that the team leaders be creative, enthusiastic, and committed to the program. 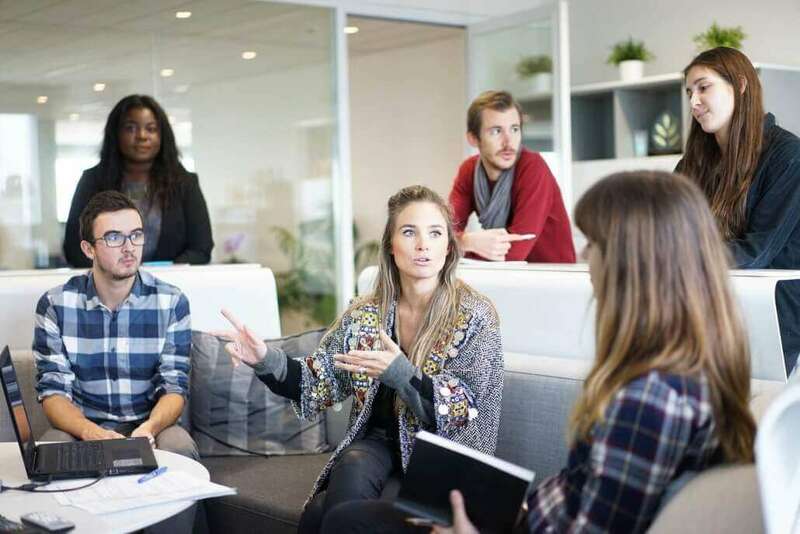 The team leaders do not have to be the most active and healthy staff members; it is more important that they have the skills to help motivate their team members to success. The purpose of completing a health culture audit is to identify the cultural supports for good health and areas that might need improvement. A health culture audit will be a good starting point for your wellness initiative and will guide the actions of your wellness committee. 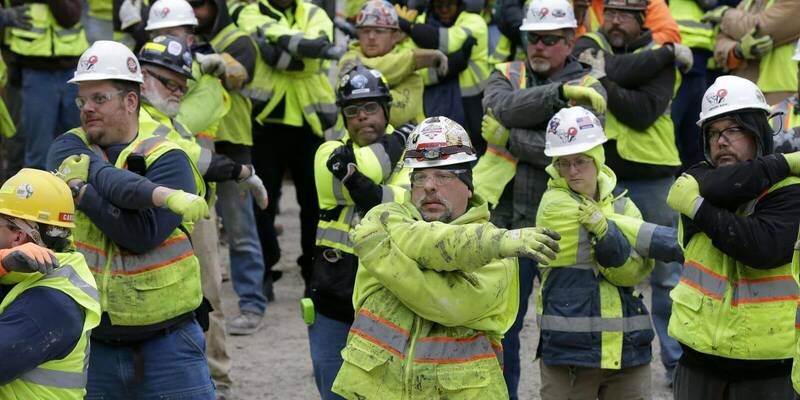 Working to improve the health culture at your worksite will make the worksite more supportive of healthy behaviors (i.e. 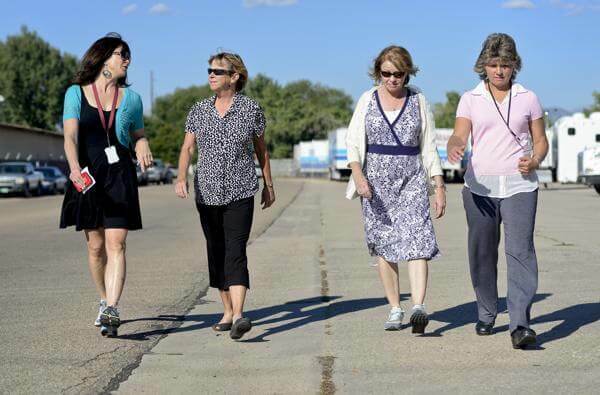 healthy food choices, no smoking policies, walking during breaks, etc.). One method for assessing your health culture can be found here. The tool is called the Checklist to Change. It will help you assess your workplace and then identify evidence-based strategies to improve workplace policy and environment. This checklist can be completed online in less than 10 minutes. It’s free and you will receive immediate feedback and implementation strategies. The most common method of assessing employee behavior is to use a Health Risk Appraisal (HRA). An HRA has two outputs. 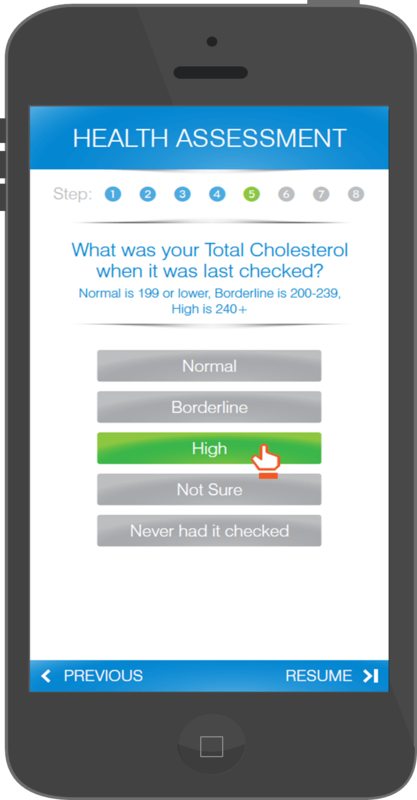 The first output is an individual report that can help your employees identify modifiable risk factors for chronic disease. The second output is an aggregate report which can be used to stratify employees according to risk so that preventable health issues can be prioritized and strategies developed. Both online and paper/pencil HRA’s are available. Web-based HRA’s are less expensive and offer feedback in real time. Whatever method you use, make it as simple as possible for employees to complete and submit their HRA so you get a high return rate. Consider offering an incentive for people who complete the assessment. An excellent HRA can be found here. A good health risk appraisal will generate useful health reports for individuals and aggregate reports for companies. How Much Do Company Wellness Programs Cost? Company wellness programs typically cost between $3 and $7.50 per employee per month ($36 -$90/ year). 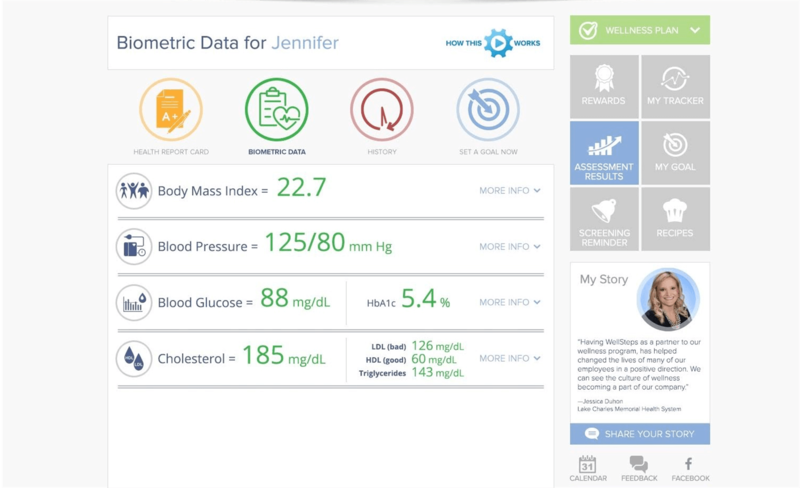 This can include a mobile app and website that can offer a health risk appraisal, incentive management, online resources, culture change, wellness campaigns and team challenges, and integration of fitness devices. Occasionally this cost will also include some money for simple incentives like gift cards or T-shirts. WellSteps has over 400 worksites that we currently work with and most of them are getting a comprehensive wellness program for around $36-$90 per employee per year, depending on the size of the company. The larger the company, the smaller the cost per year. This does not include the cost of biometric screening, health coaching, or benefits based incentives. These are not automatically included because they are the most expensive parts of any wellness program. An effective employee wellness program can cost between $36 and $90 per employee per year. Add biometric screening, telephonic health coaching, and robust incentives including benefits-based incentives and you can see how the cost grows dramatically. We have found that great participation happens if the employers will establish a benefits-based incentive plan. 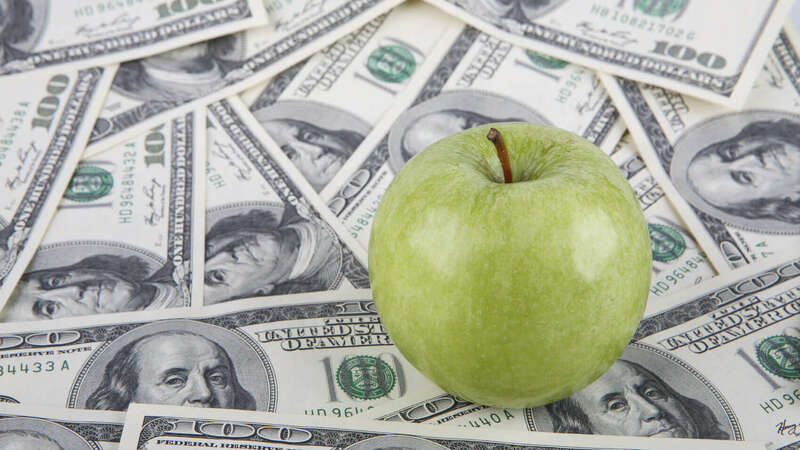 Benefits-based wellness incentive programs typically include the incentive of a discount on insurance premiums, paid time off, a contribution to an HSA or HRA, or a lower co-pay or deductible. Benefits-based incentives have a big impact on employee engagement. Some WellSteps clients offer a $50/month discount off the cost of an insurance premium. That’s $600 per year per qualifying employee. Other companies spend more and some spend less than this. According to the Washington Business Group on Health, some employers are now spending $742 per employee per year on incentives. If establishing a benefits-based incentive is too bold for your worksite, consider purchasing other incentives that are not tied to your benefits. Many of our Wellsteps clients have a small wellness budget dedicated to purchasing rewards or incentives for program engagement. Can the vendor provide careful documentation of its product/service health or cost impact? Does the vendor have evaluative data to support the product/service? Can the vendor provide several different integrated products/ services or does it just specialize in one area? Will the vendor customize the product to meet the needs of your company? What type of education and training do the professionals involved with the product/service delivery have? Is the performance of professionals delivering products/ services audited by the vendor for effectiveness, efficiency, accuracy, etc? Can the vendor clearly state in writing the products/services that will be provided? Is the vendor willing to establish a contract with your organization? Does the vendor provide you with an “account manager” who will take full responsibility for your complete customer satisfaction? Does the vendor collect adequate and accurate data on the product/service activity and outcomes? Can the vendor provide reports and other aggregate data to the customer in appropriate electronic formats? Is the cost of the product/service competitive with the cost of other vendors? Is the pricing all-inclusive (no hidden costs)? Do the results of the product/service justify the price? Here are even more ideas to help you choose the right wellness vendor. Behavior change is the key to having a successful wellness program. The best worksite wellness programs keep the focus on the need to help employees adopt and maintain healthy behaviors. Behavior change is the key to reducing health risks, reducing the prevalence of chronic disease, and reducing employee related expenses. It is impossible to have good health unless you have healthy behaviors. Behavior change strategies for wellness programs come in varying intensities including, from lowest to highest: education, motivation, tools, environment, and policy. High intensity strategies take the most effort, time, and money, but they are also the most effective. Usually, it is best to include a mix of strategies. It is possible that some of your employees are experienced in education or communications. Be sure to include them on the wellness committee. If your company uses a vendor, ensure that the vendor has access to communicate with all of your employees. Combine two good things. For example, employees can bring a healthy lunch on a day when a speaker talks about healthy eating. Add 10 minutes of activity. Schedule 10 minutes to walk to or from the cafeteria, or from the parking lot. Consider time of day and duration of activity. Match the targeted audience with the time of day and duration of activity. Many people, if given a choice of any benefit, will choose more time with family. Therefore, before and after work are generally bad times. Make it easy. Programs offered onsite increase participation. Make it convenient. Offer programs at breaks, lunch, or online. Make the choice clear. How to participate should be easy to understand. Make the benefits obvious. Highlight relevant program benefits in marketing. Free is best. Cost is a barrier: eliminate cost to increase participation. Cost sharing fosters commitment. When the employee has a tangible (money) or intangible cost (giving up something to enroll), commitment to change increases. Benefits. Health insurance rebates or contributions to Health Reimbursement Accounts are powerful incentives. Money talks. Worksites that have used cash or rebates as incentives have had impressive participation rates. Time off. Even a half-day off can be a powerful incentive. For some people, time is a more powerful incentive than money. Achievement awards. Recognition helps to reinforce program benefits. A quality certificate displayed in a public area is also a form of marketing. Public recognition. Public praise feels good to participants who have achieved goals, and creates a vicarious incentive for future participants. Merchandise. The possibilities are endless. The merchandise should be selected based on demographic characteristics of the employee population. This incentive can be awarded using a lottery style drawing. Food. Include healthy food to kick-off, revitalize, or wrap up a wellness campaign. Entertainment. 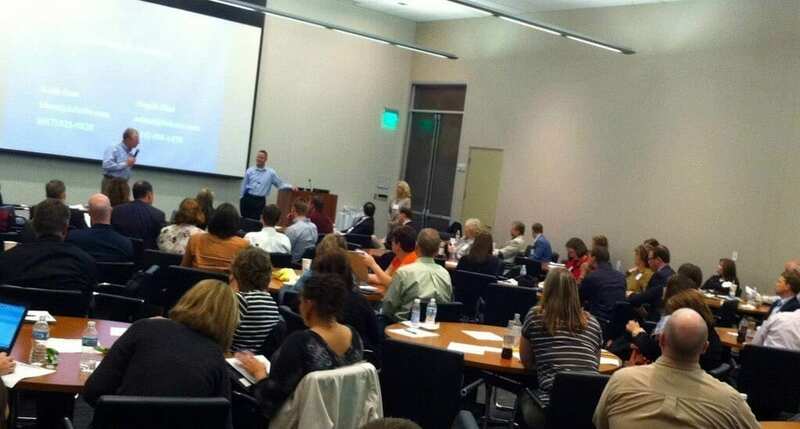 Events can help jump-start, reenergize or wrap up a program. Entertainment is generally a morale booster. Buddy systems. Supportive social groups can be the backbone for a successful program because each individual is committed to another person or team, and group programs are more fun for most people. Team competition. When “beating the LA office” is added to the reason why an employee should engage, both participation and commitment increase. Coaching. Using trained health coaches is more expensive but can help employees keep change commitments. Timing. Extra support is needed through the first 6 weeks of any behavior change process. Periodic support is needed during the first 6 months. Setting goals leads to greater participation. Whether it is a team goal of “walking” to New York City by New Years, or an individual goal to walk 100 miles, goals increase the likelihood that people will stick with a program. Tools are items or skills your employees need if they are going to be successful at changing behaviors. A baby stroller is a great example of a tool. It allows parents with young children to still walk or jog. Learning to stir fry vegetables is a skill. Learning how to dress for outdoor exercise is a skill, while comfortable walking shoes are tools. A nicotine patch is a tool. You get the idea. Your employees are going to need new skills and tools if they are going to experience long-term changes in behavior. Employees spend more waking hours at work than anywhere else. So it makes sense that changing the environment or culture of an organization would support the individual behavior change process. Policies promote widespread behavior change because they change the “rules.” Policies in the work environment not only influence individual behavior at work, but can also lead to changes outside of work. In many cases, policy changes make it easier to make healthy choices. An example would be serving bagels and fruit instead of pastries at company events. Some other examples include healthy food guidelines for company events, no smoking on company property, and company cost-sharing for health club memberships. 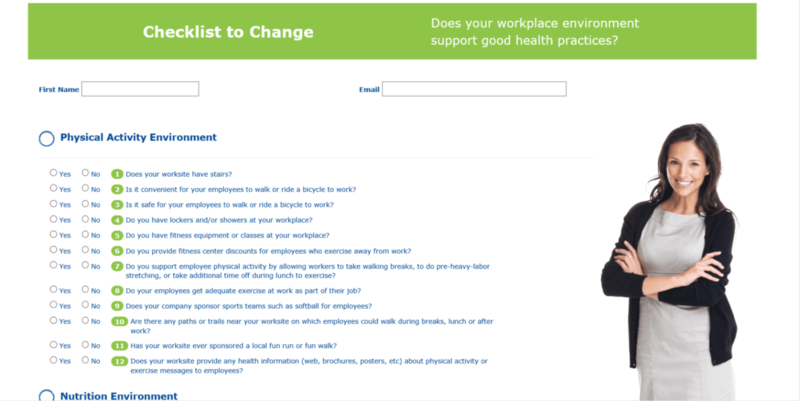 The Checklist to Change is a short survey you can take to help you see what things your worksite is doing to help or hamper healthy behaviors. It shows you what environmental and policy strategies you may not have thought of. It’s an extremely helpful tool to help you make your worksite one that supports healthy living. You can take the Checklist to Change at www.wellsteps.com. Look under the “tools” link.